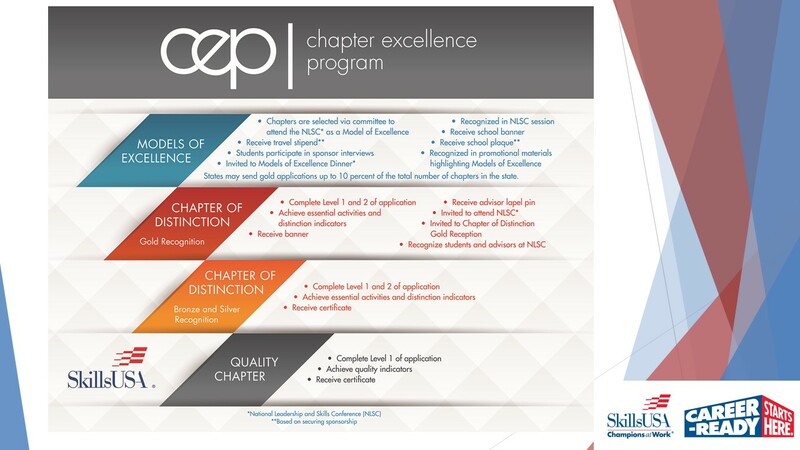 The Chapter Excellence Program (CEP) recognizes achievement as it relates to the integration of the SkillsUSA Framework in chapter program of work activities. As a chapter’s yearly action plan, the program of work is at the heart of student learning and employability development. By using the Framework as a guide, chapters have a blueprint for creating relevant activities that encourage participation and foster an understanding of student learning attained during each activity. Using the Framework, the program of work becomes the vital conduit that links students to the application of personal, workplace and technical skills demanded by industry. The SkillsUSA trifecta for student success! Every chapter is encouraged to participate in CEP and there are three award levels to recognize program involvement. The first two levels are acknowledged by a chapter’s state association and the third level is recognized nationally. Each level is designed to give chapters a benchmark for success and future improvement, leading to stronger chapters and more prepared students. The more a chapter applies the Framework, the greater the chance for CEP honors. Click HERE to watch a video on the #1 way to build your SkillsUSA Chapter through the Chapter Excellence Programs!